As of this writing, the lodge has been dark for about a month. We were well represented at the June Grand Lodge Annual Communication in Wenatchee. I thought the proceedings went smoothly and the elections had some surprises. Diane and I attended the Fellowship Dinner and were honored to sit at the table with the Grand Master of Alaska, my previous jurisdiction. He is from the Kenai Peninsula and we had some good talks about our Alaska days. One of the District Deputies is a talented musician who can come up with lyrics and guitar accompaniments to honor our Grand Lodge officers almost at the drop of a hat. I was counting on winning the raffle for a half of beef for the lodge dinners, but alas... It did raise a lot of money for our youth groups. MWB Jim Mendoza was installed and included voice and piano accompaniments into the ceremonies. He is a musical theater enthusiast and has many friends in the performing arts. He outlined his ambitions for the coming year including addressing the problem of membership retention. Our Brother Kurt Gazow was specifically mentioned in his remarks as part of the program to leverage technology. 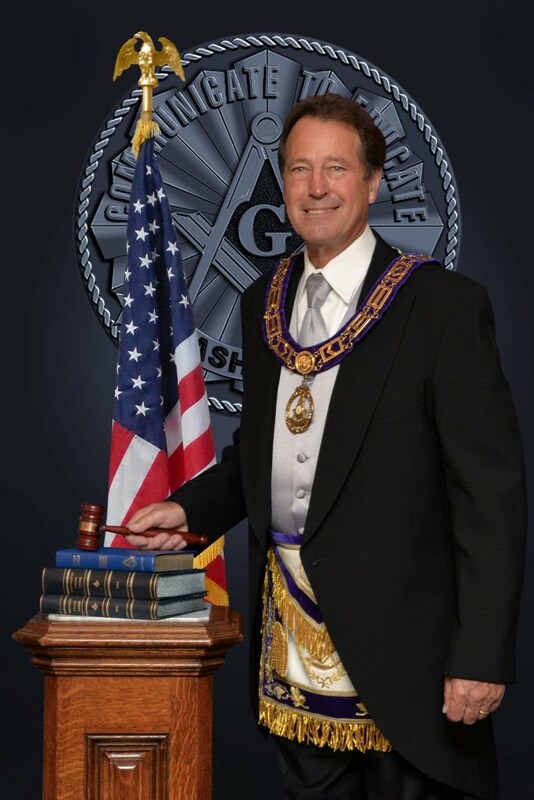 Gordon Johnson, Washington Lodge #4, District #19, was installed as the Grand Standard Bearer. I am sure he will be doing a lot of statewide travel this year. I enjoyed the company of North Bank Brothers WB Jim Cobb, WB Kent Stradley, Bro James Beebe, Bro Paul Haukaas and WB David Rice who were in attendance from our lodge. This was outstanding representation. WB Kent Stradley will have a busy summer with our “Bikes for Books” program. In July my church celebrated our Masonic Widow Lila Trammel’s 100th birthday. Bagpipers and other Scots musicians celebrated at a well attended luncheon in her honor. Brother Beebe has been planning a trip to visit our Canadian brothers at De Wolfe Lodge in Port Coquitlam, BC for their installation of officers on September 24th at 2:30 pm. This will restore the tradition of exchange visits. Diane and I will be extending our visit to Vancouver, BC as we have not yet had the opportunity to explore this area. Mark it on your calendar and invite any Masons you know so we can have a great showing. Be sure to let Bro. Beebe know of your plans. Plans are being made for our first meeting after our summer break on September 19th. We will be honoring our Past Masters with a Family Dinner and program. Be sure to mark your calendars.